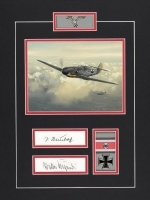 "General Johannes Steinhoff Knights Cross, Oak Leaves & Swords and Generalleutnant Walter Krupinski Knights Cross, Oak Leaves"
Two Luftwaffe fighter pilot legends. Both flew in the Battle of Britain, on the Eastern Front, and returned to fly the Me262 jet in the final Defence of the Reich. Krupinski flew 1100 combat missions and between these two great fighter aces, they achieved 373 aerial victories. After a highly successful career on both West and Eastern Fronts Steinhoff was commanded to form the first jet unit in late 1944. Rebelling against Reichmarshal Goering’s fighter tactics he was sent to join Galland’s famous JV-44 jet fighter wing. With Galland, Steinhoff recruited Walter Krupinski, one of the Luftwaffe’s most tenacious fighter aces, both pilots ending their WWI combat careers in Galland’s ‘Squadron of Experts’. Darryl Legg’s realistic painting of Adolf Galland’s Messershmitt Bf 109 f-2, flown while leading his famous JG-26 fighter wing based at Abbeville, Northern France, 1941.